Latest Poll: Zero Percent of Black People Support Mitt Romney! Hey, are things not ridiculousness enough? It turns out that zero percent of Black People want to vote for Mitt Romney. There is not a single black person in the entire country that supports the Republican for President in 2012. Does that sound like a joke? Well, read this excerpt from Daily Kos. "Looking inside the numbers, Obama continues to lead Romney among key parts of his political base, including African Americans (94 percent to 0 percent), Latinos (by a 2-to-1 margin), voters under 35-years-old (52 percent to 41 percent) and women (51 percent to 41 percent). Zero. For historical reference, George W. Bush received 11% of the black vote in 2004." The only black people that are supporting Mitt Romney and the Republican party for president are the margin of error. Talk about unpopular. I am not. Most people don’t care about elections…..irony for a post topic. 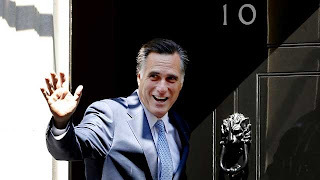 Mitt Romney's real name is Willard. EEP! There is the reason...The name Willard Mitt Romney just won't cut it in da hood.